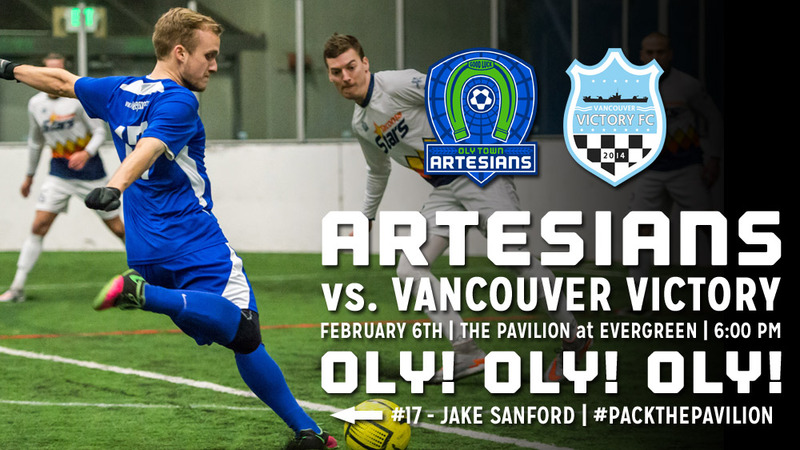 OLYMPIA, Wash. – The final homestand of the 2015-2016 season kicks off on Saturday night when the Oly Town Artesians welcome the Vancouver Victory to The Pavilion at The Evergreen State College. It’s a rematch of one of the best games of the Western Indoor Soccer League season to date and marks the return of head coach Matt Stalnik to the field after a serious knee injury last season. In the first meeting between the two teams in Vancouver, the Victory took a 3-2 lead into the fourth quarter before Alex Castillo tied the game and JC Henson scored with less than a minute to play to give the Artesians a 4-3 win. Goalkeeper Evan Munn was awarded his first WISL Defensive Player of the Week award for his outstanding performance in just his second career indoor soccer start. Injuries have plagued the Oly Town squad since then with an entire first line lost for the season and the Artesians are 1-6-1 with two games left to play. Before last week’s bye, Munn was named Defensive Player of the Week for a second time for his incredible performance where he made 27 saves in a 6-2 loss to the high powered and first place Olympic Force. Tanner Allison scored both goals against the Force and has four goals in the last three games. The struggling offense will get a boost of experience when head coach Matt Stalnik returns to the field. Stalnik tore his ACL and MCL amongst other injuries on a malicious tackle by an Arlington Aviator player immediately after scoring the game winning goal with less than five seconds to play in December of 2014. The Alaskan goalkeeper turned forward recorded the first hat trick in Artesians history and tallied four goals in three games last season. Assistant coach John Purtteman, a member of the Washington State Soccer Association Hall of Fame, will take an increased role on the bench with head coach Stalnik on the field. Vancouver is still looking for their first WISL victory and are also coming off of a loss to the Olympic Force. Their 16 year-old goalkeeper Zachary Morris was named WISL Defensive Player of the Week and Matt Paine tallied a hat trick in the loss. First kick on Saturday is set for 6:00 PM, doors open at 5:00. Tickets are $8 for adults, kids 5-12 are $5 and kids under five and Thurston County Youth Soccer Association players in uniform are free.